...from the well within. I have been stuck on this thought for the past two weeks. There have been season of my life in which I feel as dry as dirt. 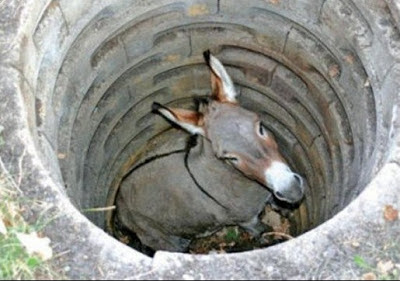 There couldn't possibly be anything in my well even if I wanted there to be. Other times, I feel like there is a leak in my well. Sometimes it is overflowing. And even others, my well is stagnant and toxic to anyone who might draw from it. Sometimes, a random donkey. What is the condition of your well within? Can you cast your bucket down and bring up that which will quench and refresh? Do you even know where your bucket is?! Wells can vary in depth, volume and water quality. What is yours like? I am blessed beyond blessed to have the incredible family I do; to have Blake, Haley, Kelci and Leslie. They have seen to it that my well is fully stocked with fresh water. Life, Scripture, truth, hope and joy are continually poured in. I have been equipped with the ability to draw from that refreshing well. Unfortunately, I have recently witnessed quite the opposite. (It is those closest to us who have the ability to either bless our well or make it toxic.) Friends whose families, churches, relationships, etc. have caused their well to become toxic. They have little to nothing safe and soothing to draw out of their own well. 1. Are you blessing and enriching the wells of other people? Or are you, by your cutting words and controlling actions, dumping toxic material into the hearts of others - into your spouse, children, friends? 2. What is the state of your well? Maybe you are like me and have a well that has been established in the truth of the Lord and allows you to thrive. If you do, be exceedingly thankful. If you do not, surround yourself with those who will help you clean and un-contaminate your well; who will pour into you that which will heal, cleanse and restore. The well within is important. During Bible times in the Middle East (and in Texas today!) the person who owned the well also owned the land surrounding it. I believe the well within is your heart. You also are made up of "the land surrounding it." The rest of your body, your being, your words, actions... Does your "land surrounding" reflect a well that flows with refreshment and life? A toxic well must often be drained and thoroughly cleaned before it is even reconsidered for use. If one drank from a toxic well, serious illness or even death could occur. Such water was often not safe for livestock - and in some cases, even irrigation. 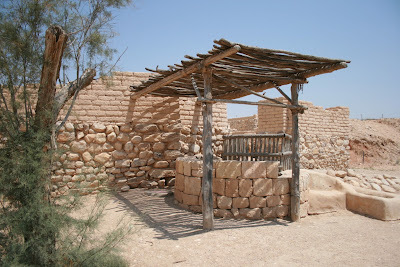 In Jesus' day, attackers who wanted to prey on and intimidate their subjects would often poison or break down water wells, knowing it was their enemies' source of life. Do you not think the Devil would love nothing more than to break down your well? That is what he is trying to do! The Devil is dumb... he never has new tactics - just the same old tricks over and over. Don't let him get away with damaging the well of your heart. If he can cut off the water supply, he controls your life. Dannah charged us with the responsibility of keeping a watch on our well and also doing intentional things to "fill our bucket" full of the good stuff this summer. What will you do to clean up and take care of the well within? Often we feel dry emotionally and spiritually simply because we do not put forth the effort to fill our bucket. If Jesus is your Lord and Savior. If HE is your everything. The well within is Christ Himself. He lives in your heart. WISE is the one who draws from that. God is truly the only one worth drawing from. Other people in our lives are simply a bonus. So, it does not really matter if you have been blessed with extra sources of nourishment or if others have tried to contaminate your well. Your heart belongs to the Lord. He is your well - the only well that will never run dry - the only well that will satisfy - the well that causes you to thirst no more. Draw from Him. Take care of your well within - guard it and draw from it. "Fill your bucket," as Dannah would say. This summer I will be intentional about protecting my well and drawing from it by daily, intentional times in the Word, surrounding myself with those who speak truth and life into me and distancing myself from those who do not, reading books that build and challenge my faith and I will write as God continues to direct me. I will be hosting some summer activities for my Bible class to continue to pour life into their wells. What will you do? Great insights! Thanks for sharing.